When I walk into a new teaching space, I love the opportunity to try and make the space as welcoming and calming as I possibly can. I haven’t quite mastered this craft yet, however, as a general rule, I try to make sure that I don’t display things in our classroom that I wouldn’t want in my own living room. The challenge can sometimes be working with what is already in the room, but when I am mindful of this, I know that at the very least, I am not bringing more “noise” into our learning space. (If you are interested, “before” pictures can be found at the bottom of this post). This year, I took some time to explore other opportunities in our district for the first few months of the school year before accepting my current position. 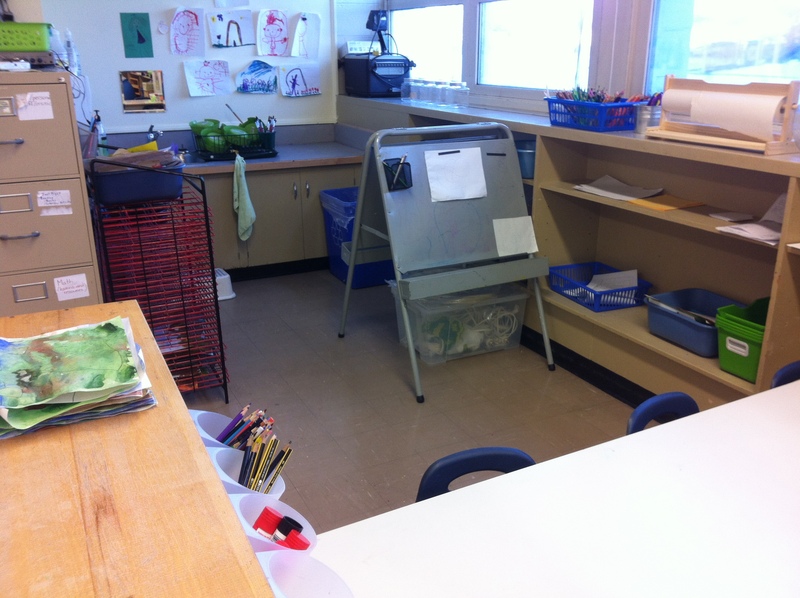 At the time of this post, I have been in this space for 12 teaching days so I still consider our space a “work in progress”. As my students and I are continually growing, learning and evolving, can any space ever really get to the point where it is considered “done”? As it currently sits, I feel that the space is already becoming one that provokes curiosity, exploration and independence. As you look through the images below, you will notice some large areas devoted to play as this is something I truly value when working with early learners. To the right of the door, there is a little table. One basket is to collect library books and book bags. The other is for agendas and home reading folders. (The rocks all have student names on them. As they put their agenda in the basket each day, they also put their rock in the jar. My “helper” can then read the names on rocks still out and gently remind those students to get their agendas). Under the table is our juice box recycle bin and a bin where we keep indoor shoes. The next thing you see as you make your way counter-clockwise around the room is this blue table and a shelving unit with our “tub toys”. Behind the green divider, is our “house centre”. Here is another view of the “blue table” from a little further back. In this photo, you can also see our little white table which is currently being used for smaller blocks and in the bottom lower right corner is the edge of a pellet table we are currently using. Behind the mirror shelf (pictured above), we have a little yellow table. 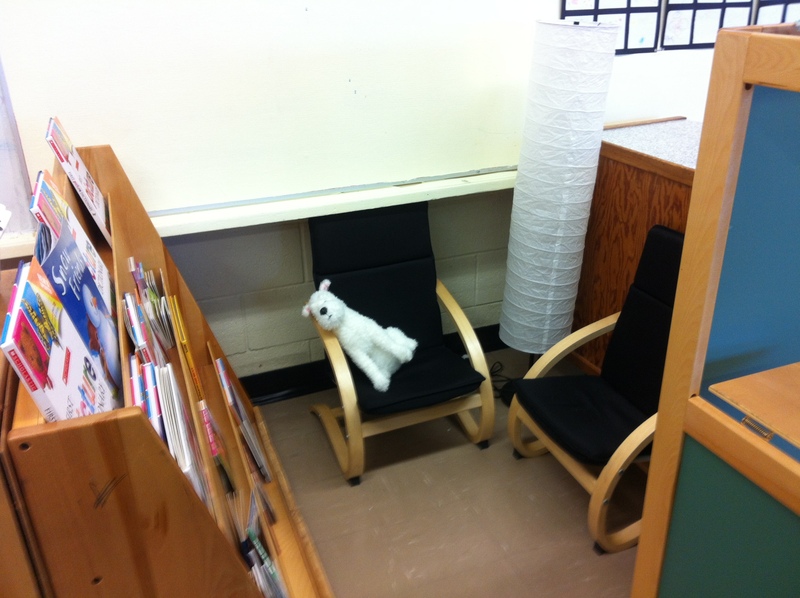 Currently this is our “story-telling” area where students use puppets they have made (or other finger puppets) to retell stories we have been reading in class. Can you tell that their current favourite is “The Three Billy Goats Gruff”? Next to the “blue table” is our “house centre”. 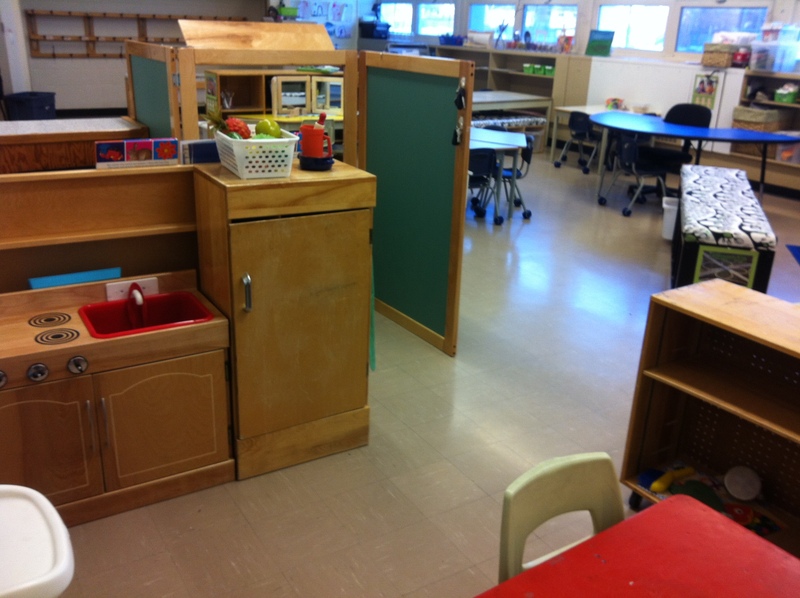 As you can see, it has quite a big footprint in our learning space. Next comes our carpet and big block area. Along the wall under the SmartBoard are 3 big buckets with our smaller wooden blocks and on the shelves under the windows are our big wooden blocks (The sign on the block left out shows they have been busy building McDonald’s this week!). The bench in the foreground stores bins for trains and cars, etc. The last big area as you move though our space is our “art” space. In this first photo, you can see a small table that currently is being used for playdoh as well as our big art table. Mounted on the shelf (in the bottom right corner) is a rack to help organize some of the drawing and colouring materials that are used most often. 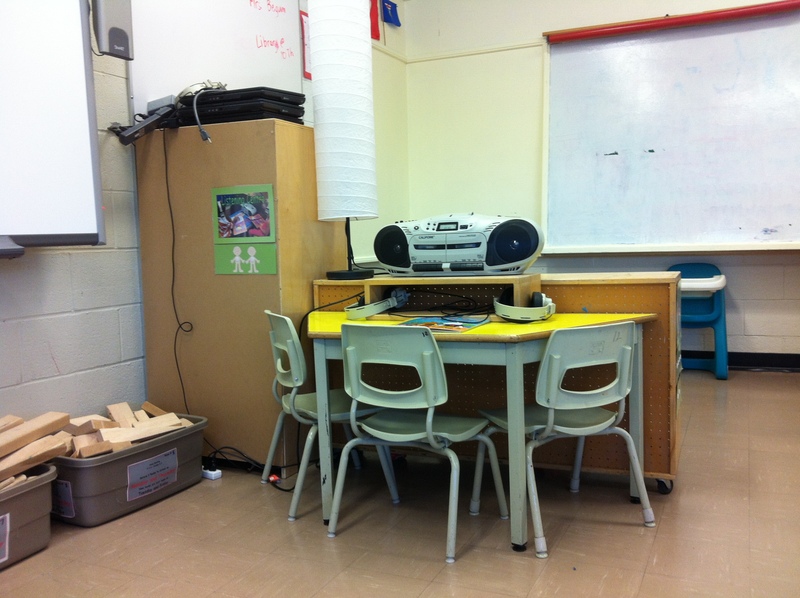 In this picture, you can also see our coat hooks and the pellet table that is currently out (it is on wheels so we roll in to this space for centre time and then tuck it in by our easel for the rest of the day so we have enough room when we come in or are getting ready to go back outside). And lastly, you see the easel, counter and sink and our drying rack. And that is pretty much it. As you can see, it is a busy place with plenty going on. I hope you enjoyed the tour and maybe left with an idea or two to use in your own space! As always, I welcome any comments or suggestions below. Turn counter-clockwise some more and you see the gathering area and smart board. 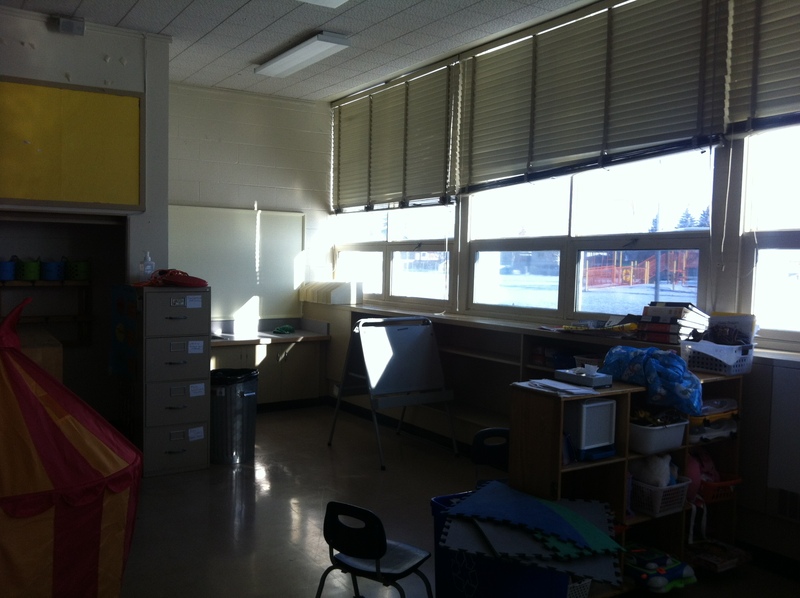 (The empty corner by the Smart Board is where the teacher desk was once). Continue to turn counter-clockwise and you see the back nook with a sink and counter. This entry was posted in Kindergarten, Maternelle, My classroom, Organization and tagged centres, class setup, classroom organization, kindergarten, learning through play, play, Reggio. What a beautiful space! I love the rock sign in and the mirror table. Thanks! 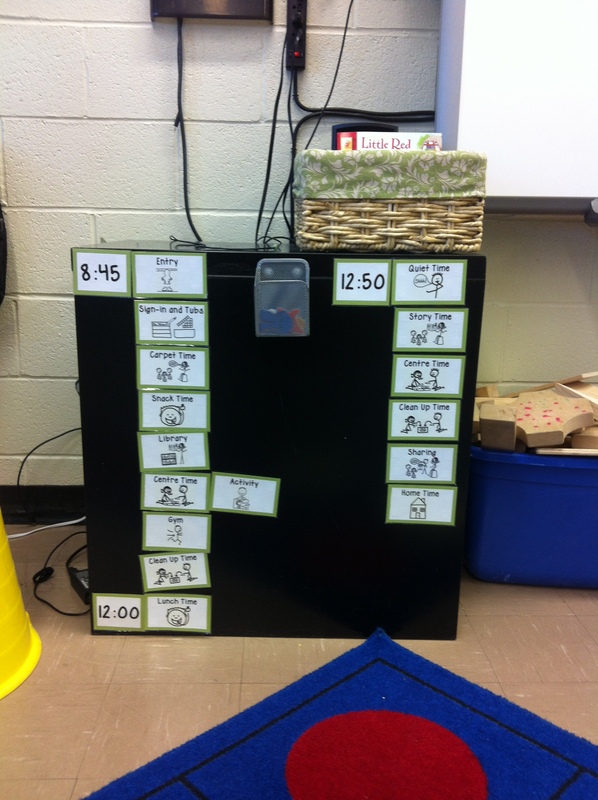 I like the rock thing too…..I “borrowed” it from a class I was subbing in earlier this year. I love how your schedule is down so low for the little ones. Great idea! It really does work well there….and then I could just use magnets to stick it to the filing cabinet.